I’m done. Stick a fork in me. Cooked. Tired. Knackered. Straight up worn out. Y’know how I know? Every little bug knocks me down. I want to sleep but can’t. I wake up more than I’m asleep it seems. Even with chemicals. That said, I’m taking the rest of the year off. I get on a plane tomorrow and head for Arizona hoping to recuperate and recharge and maybe stem the bleeding that is my will to continue as a nurse. Burnout is a terrible thing. So I’m going to enjoy a white Christmas in the White Mountains with my family. Hope everyone has a wonderful Christmas and a great New Year. I’ll be seeing you in 2012. Promise. That was my ride to work last night. Not quite so dark though. And even though I arrived with soaking wet socks and slowly drying shorts I loved every moment of it. I’ll admit, I love Fall. For a place with such relatively mild weather, we here in Oregon tend to complain a little too much about the weather. I mean really, it rarely snows, it rarely gets over 100 degrees, no tornadoes, no hurricanes, but let me tell you, when something happens it’s like the Apocalypse. Last month, we had a snowstorm. Actually several snowstorms, that left at most 16″ of snow over the course of several days. Of course leave it to the news to label this phenomenon of the *cue dramatic music* Arctic Blast 2008. Yes, it was a mess. Icy roads, bitter cold with a biting wind and the town acted like we were transported to the Arctic Circle. What made things worse was the hysteria stoked by the news media and the inability of our local governments to effectively manage the roads and related infrastructure. I lived in Flagstaff for 3 years and had several times where we got over a foot of snow in less than 12 hours, but the town shut down only once and that was because we got 3 feet of snow in a 24 hour period. That really is near cause for hysteria. But the only people in hysterics were the tourists from the Valley of the Sun. But it’s always the same. Whether it is “Fall Floods ’07”, or “Heat Wave 2008”, “Arctic Blast” or the soon to come “Floods of 2009” on the news media whips us into a frenzy. For days on end the local channels had nothing on but news, relating the same stories ad nauseam and bringing the dire reports of more nasty weather to come. All it takes a little change from the normal for them to start the dire warnings. One anchor in particular is never happy with the weather. When it rains a lot she complains about the lack of sun, but when it has been sunny for a long time she complains about the lack of rain. She always has a snarky comment about the weather. But I love it. I was out in the weather on my bike nearly everyday of it. I rode to work all but 2 days of the storm that I did work. My co-workers looked at me in disbelief when I walked in head-to-toe in my foul weather gear. But really, it was just another day. No weather wimp here! Like I’ve been saying the weather has stunk. Ice, snow, black ice, wind, the works. While compared to other spots, not quite so bad all things considered. However I’ve been out on my bike riding to work. Yes, I’m a little crazy. The first night was nice. Traffic was really mild, it was slick and slushy and I arrived with soaked shoes and a little chilled, but overall good. The second night had less slush and ice, but it started snowing when I got into downtown. In the morning was very, very slick, lots of ice with a dusting of snow over the top of old ice. Not fun. The best thing though? I stayed vertical on all the rides. I can’t afford a broken bone right now, so this was a good thing. Here’s me dressed to the nines to deal with the weather. It’s like ice skating out there. I may look goofy, but I was warm and dry. The wife and I bundled up and braved the elements of our, “Arctic Blast” to hit the store for some necessities. It was peaceful in a way. White fluffy snow underfoot, stinging blowing snow freezing gthe face off and the ubiquitous dodging of idiot drivers who think they can drive in the snow. All I hear when I step outside, besides the howling wind, is the steady thrum of chained up vehicles. It’s kind of soothing. I know we have nothing to compare with to say, Fargo, but I live in Oregon to avoid that kind of nonsense. Usually snow here is easy, it comes, maybe for a day or two, then it’s gone. But right now it is looking like this nastiness is going to be around for awhile. They’ve been requiring chains or traction tires on all highways in the Portland metro area and the main road from where I live into work is a solid sheet of ice right now. Luckily I don’t have to work until Thursday. The city is trying to shut down, but it’s just not happening. 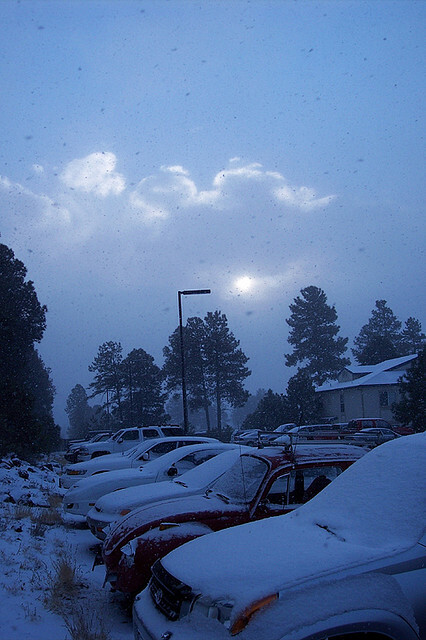 The second winter we lived in Flagstaff there was a massive storm the day after New Years. I thnk when the flakes cleared it added up to 3 feet and the whole town shut down completely. Nothing was open, nothing was running and the town was silent. People were doing the right thing and staying home. Unfortunately that isn’t true here. I saw many people when we were out that were just doing their normal things, which seems kind of unreal. You actually have a real excuse to stay home, but you decide to venture out. Makes no sense to me. The fun is going to be the commute tomorrow morning when thousands hit the the ice to get to work. And I have to figure out a way to the airport to pick up the Father-in-Law. It’s going to be a slow, cold trip. I can’t drive because the car is rear-wheel drive adn I have no chains for it. I ain’t crazy enough to venture out in that vehicle in this weather. It’s going to be fun. Oh yes, let the madness begin. The news people have been going into overdrive mode this week for our “Arctic Event” that is supposed to arrive today. They’re all in a tizzy because we could get snowdown to the valley floor (Willamette Valley y’all) with some accumulations in the higher elevations. That mania combined with the pre-Christmas insanity is causing a run on candles, canned meat, batteries, toilet paper and bottled water. In essence folks are stocking up and digging in as if we were getting feet of snow. Like a Midwest style blizzard or nuclear winter. But no, we may get a couple of inches. Yes, a couple of inches. And people are freaking out. The cities, counties and the State are ramping up their road crews, utilities are putting everyone on stand-by and it is just general madness. The temperature show 36 F outside and it’s raining. I know that because they have made such a huge deal about snow that it will be a non-event. I went to school in Flagstaff and dealt with snow regularly through the winter, driving to and from school, work and clinicals in my VW Bug. It is not a big deal. But people here make it out to be the end of the world. I don’t worry about my ability to drive in such weather, but it is everyone I am worried about. If it does snow and/or get icy, I’m going to hang out on the couch with a warm adult beverage and watch the carnage unfold live on TV. That’s a mighty big if. But as far as events go, my Father-in-Law arrives on Monday from Arizona. Yes, both in-laws will be in my house (they’re actually divorced) for a week, pretty much unannounced. He called and said, “I’m going to be there on Monday the 22nd, as a surprise for Christmas.” Will he stay in a hotel? No. Will he rent a car? No. He will sleep on my couch, drive our car and eat our food all week. I’m so excited about it that I put a countdown timer up to remind me how long it is until he leaves. It’s not that I don’ get along with him, we’re cordial and do get along fine, he just adds another unwanted layer to stress to the house. My revenge? We’re going to be having highs in the hgh 20’s the week he’s here, and I work nearly every day. Avoidance is not neccessarily a bad thing.